STSbet are looking to make their mark on the UK market. Use of the STS promo code will help you to claim a £35 Free Bet sports welcome bonus. This offer is available to all new UK customers at STSbet. There are other promotions available too, we’ll look at these in more detail shortly. For now, the table below shows an overview of what bonus opportunities await at STSbet. What Can I Get With The STS Promo Code? Significant Terms and Conditions – Welcome Offer -18+/Applies to new UK Customers who make a deposit of £5 and a first qualifying accumulator bet between £5-£35 on a minimum of 3 events within 14 days of opening account. Odds of 1.8 or greater. Qualifying customers will receive a Free Bet Token matched to the amount of the first qualifying bet up to £35. Token paid out within 24 hrs of qualifying bet settling. Limited to sportsbook section including pre-match, inplay/live markets. Payment, cashout, withdraw limitations apply. Full T&C apply. Sports ACCA – Place a football multiple bet on at least 6 selections and if one selection loses, we will refund 100% of the stake as a freebet token. Minimum stake £2, maximum £50 with minimum odds 1.6 each. You can then make your first deposit and qualify for your sports welcome offer. All bookmaker offers and promotions come with a set of terms and conditions. The STS promo code and associated offer are no different. Let’s discuss what t’s and c’s you’ll need to meet in order to claim your £35 Free Bet Token. Once you’ve successfully deposited a minimum of £5, you can make your qualifying bet. This bookmaker offer works slightly differently to their competitors. Instead of placing a Single bet, your qualifying wager needs to have a minimum of three selections. You can bet on any sport you like. Place a stake of between £5 and £35 on your Treble/Accumulator. Each leg of your Multiple needs to have odds of a minimum of 4/5 (1.8). You will receive the amount you stake as a free bet, once your qualifying bet has been settled. So, if you deposit and bet £20, you will receive a £20 free bet. Time restrictions apply to the use of the STS promo code. All selections in your qualifying bet need to be settled within 14 days of creating your account. Once you’ve received your free bet, use it on any sport of your choosing. You can only use your freebie, however, on odds of at least 4/5. Remember, you may need to enter an STSbet promo code when you sign up in order to qualify for this offer. And there you go. STSbet has provided a pretty easy welcome offer to qualify for, and it’s one that competes well with their competitors in the United Kingdom. The terms of this offer can change, so it’s important you understand the t’s and c’s before you register an account. There are other STSbet promotions available for existing customers. We expect more new customer bonus opportunities to be introduced, such as a Casino bonus, once STS have fully expanded into the UK market. We’ve examined the recurring promotions available at STS, you can see our findings below. These offers don’t require the use of an STSbet promo code, but remember to check the t’s and c’s of each offer before you bet. Place a correct score bet on any match taking place in the Poland Ekstraklasa and if the game ends goalless, you’ll receive 50% of your stake back as a free bet. The maximum refund amount is £25. So, if you bet £50 and the game finishes 0-0, you’ll receive the full £25 free bet amount. The minimum bet for this offer is £2. This STS offer is focused on English Premier League action. It rewards customers who place a number of wagers on EPL matches each week. 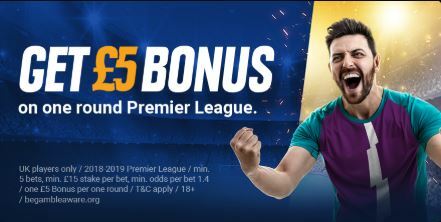 Place five bets or more in a single Premier League fixture week and you can receive £5 as bonus funds. Each bet must have odds of at least 1.4 with a minimum of £15 staked on each. You can bet pre-match or in-play to qualify for this offer. You will receive your bonus funds if you’ve met the t’s and c’s, no matter the outcome of your qualifying bets. Fan of accumulators? The STS Extra 6+ might just be for you. Place an accumulator of six legs or more and if one selection lets you down, you can get your stake back as a free bet. This offer is only available on football matches in the 1X2 market. The maximum refund amount is set at £50. Minimum bet of £2 is required. Key Terms and Conditions – Place a football multiple bet on at least 6 selections and if one selection loses, we will refund 100% of the stake as a freebet token. Minimum stake £2, maximum £50 with minimum odds 1.6 each. After expanding across Europe, STS are now making their way into the UK betting scene. The best bookmakers in the United Kingdom offer a vast range of sports and events to bet on. STS is looking to challenge immediately and offer odds and markets on over 40 different sports. If you’re a fan of football, there’s something for you to enjoy at this bookmaker. STS impresses with the number of separate markets available on football leagues and tournaments from across the globe. It’s not just with the beautiful game where this bookmaker excels. There’s plenty of opportunities to bet on some of the world’s most popular sports. Basketball, American Football, golf and tennis are covered, with major leagues open to you. ESports get lots of coverage too. You can bet on pretty much all major international events at STS bet. Counter-Strike and League of Legends are two of your options. If you like online casino action too, you can enjoy a range of table games and slots at STS. Live Casino is also an option for you. Any Casino promotions may be subject to the use of a separate STS promo code. There is no STS live streaming available yet. We expect that they will add this feature in the coming months. You do have plenty of in-play betting options, though. The variety of live betting options include football, tennis, golf, basketball and more. A stats feature is offered on all live betting opportunities too, designed to help you assess the value of the odds offered. Cash out is also an option for you. If you’re looking to cash out any live bet, go to the My Bets section on your account. If cashout is available, it will be listed with the current price. Hit the Cash Out button and confirm your decision. At the time of writing, there isn’t a dedicated STS mobile app available right now. This doesn’t mean that mobile betting isn’t a possibility. While we wait for the STS app to be released, you can visit the bookmaker site through your mobile browser. We used an Android operating system to test out the STS mobile version. The mobile site works just as well as the desktop version, with its smooth and seamless interface and easy navigation between markets. You can bet live and use the cashout function with the mobile site. If you want to sign up using your mobile, this is a possibility too. Visit the site and hit the Join button. Fill out the registration form and enter the STS promo code if one is required. Note that minimum deposits and withdrawals vary, depending on which method you’re using. Fees may also apply to some of these methods. If you want to use the STS promo code to claim your offer, remember that only selected deposit methods will qualify. Deposit options exempt from the offer are listed at the beginning of this article. STS customer service is rather limited. This isn’t surprising, considering how new they are to the UK online betting scene. If you have an issue using the STSbet promo code, a betting query or an issue with deposits, you can visit the Contact Us tab. Fill in the form provided and you’ll receive a response via email. We do expect a Live Chat facility to be introduced at some point, along with a more responsive customer support service. We’re pretty impressed with what’s available at the UK’s newest online bookie. There is such a fantastic range of sports you can bet on here, putting some of the established bookmakers to shame. It’s tough to get everything right, though, especially as STS is just breaking into the online betting scene here. We’d like to see the introduction of a dedicated betting app and customer service options to be improved, but we expect this to happen in the near future. Most promotions are only available on football events. It would be nice to see other sports get the bonus treatment soon. This shouldn’t put you off signing up with STSbet now. Use the STS promo code to claim your rather tasty new customer offer of a £35 bonus. If you’re looking for more information, we’ve provided a list of questions and answers surrounding the STS promo code, and more, below. Is There A STS Promo Code Currently Available? You can claim the STS promo code via buttons on this page. The current £35 welcome offer could be claimed with it. If any other offer needs an STSbet promo code to qualify, we’ll let you know here. Who Can Claim This STS Promo Code Offer? All new customers aged 18 or over can qualify for this welcome offer. Make sure you read the terms and conditions before you create your account. There is no specific mobile bonus available right now. It’s possible that once the betting app is released that with it will come mobile-only promotions. You can, though, qualify for the general welcome offer using your mobile device. You are only able to claim one welcome bonus. The other promotions are aimed at existing customers, which you can claim once you’ve created your account. I Can’t Get The Bonus, What Should I Do? If you’ve met all the terms and conditions and you’ve still not received your bonus, get in touch with the customer support team. Your customer service options are limited right now, but visit the Contact Us tab and complete the form provided. You will receive a reply to the email address you provided.